Whether you are young or old, being active is important. However, orthopedic injuries are common when it comes to sports activities such as skiing, snowboarding, football, and more. ACL tears and labrum tears are two common injuries. Dr. Langland, an arthroscopy orthopedic surgeon at Iowa City Ambulatory Surgical Center, weighed in on these types of injuries and how to help you avoid injury. However, if you do become injured, you can learn more about what to expect in the healing process. As you prepare the tools you need to be active, don't forget to prepare your body! 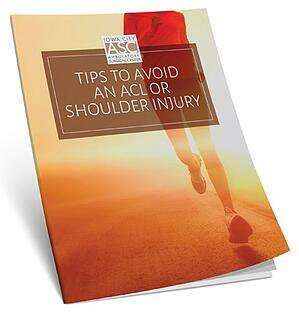 This download will provide tips on helping you remain free from injury.